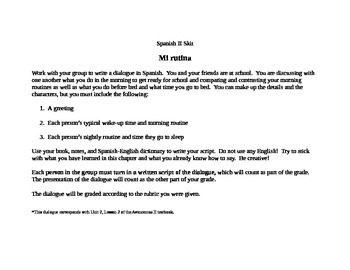 This bundle includes 8 skit assignments for use in Spanish II class. 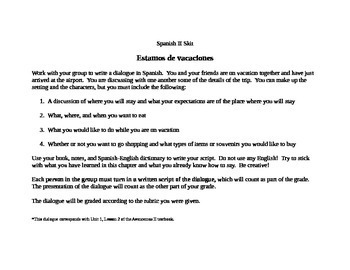 Topics for the skits are: how are you?, vacation, daily routines, market, asking for directions, restaurant, texting, family reunion, and careers. 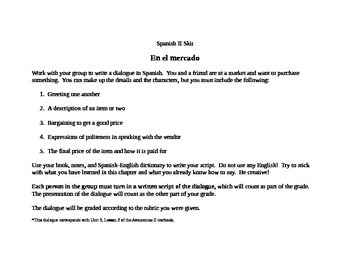 The skit assignments detail for students what the requirements for the skit are, and a rubric is included for assessment purposes. 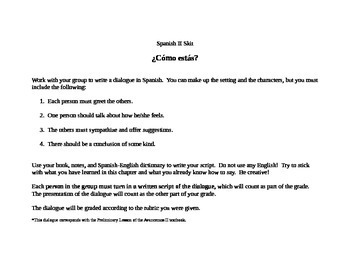 My students work in groups to write and perform skits in Spanish II. This provides an outlet for creative writing and acting as well as application of the vocabulary and grammar components of the unit. Plus, students have lots of fun with it! This assignment corresponds with the 8 units of the Avancemos II textbook, but could easily be used with other curriculums as well.